We'd like to welcome you and say "Thank you" for considering us for worship. We want to make it as easy as possible to not only navigate our church grounds, but to feel at home in our church family. Fair Haven is a diverse worship community of Chapelwood U.M.C, offering two different worship services every Sunday. The nursery is staffed and available for infants through two-year-olds during all services for your convenience. More information about the nursery can be found here. 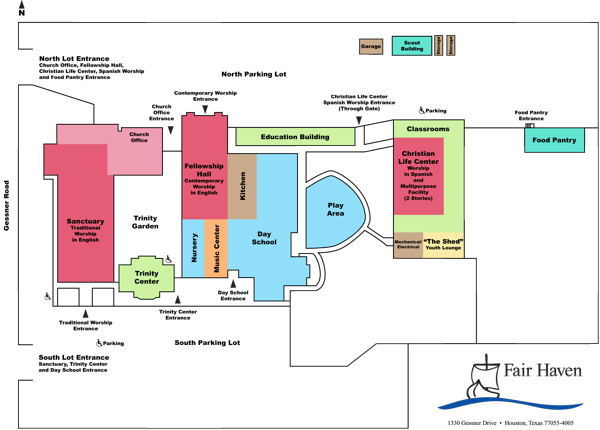 Here's a campus map to help you find where you want to be. You'll notice that our campus is equipped with two parking lots and many access points to get to your worship destination (shaded in red). Please use the above map as a reference guide or view a closeup suitable for printing. As you can see it will point you in the right direction for each service, Sunday school, food pantry, church office, and more. Also, feel free to call us with any questions you may have about finding any of our programs at (713) 468-3276.